Swansea's Matt Grimes has been included in the PFA League Two Team of the Year. 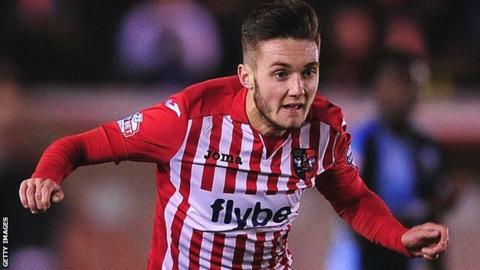 The 19-year-old midfielder impressed in his first two years as a professional with Exeter City, making 58 appearances, and earned a £1.75m move to the Premier League in January. Portsmouth striker Matt Tubbs, the league's top scorer with 20 goals, joins him in the team of the year. Team-mate Jed Wallace is also included, along with promoted Shrewsbury pair Connor Goldson and Ryan Woods. Southend keeper Daniel Bentley was also voted in by his fellow League Two players, along with Shrimpers defender Ben Coker. Promoted Burton Albion are represented by defender Phil Edwards, and the rest of the team is made up from Luton centre-back Steve McNulty, Bury midfielder Danny Mayor and Plymouth forward Reuben Reid.